CyberPower is the Bronze Winner of the 2017 ChannelPro Readers’ Choice Award for Best UPS & Power Conditioning. 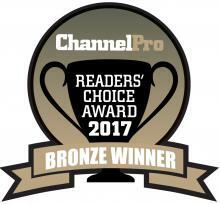 The ChannelPro Readers’ Choice Awards winners are chosen by readers of ChannelPro magazine and their website visitors. The ChannelPro Network provides IT consultants, VARs and MSP decision makers with business and technology information vital to their success in serving small to medium size business.